Fixel Institute Co-Director Kelly D. Foote, M.D., left, and Executive Director Michael S. Okun, speak during the Friday, Jan. 18 gift announcement. 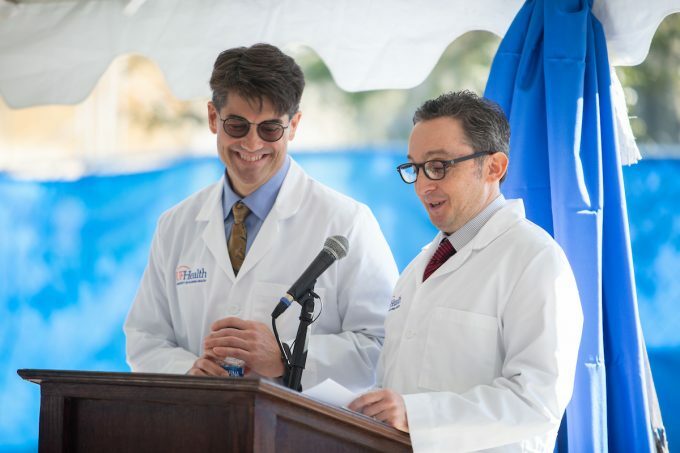 On Friday, Jan. 18, the University of Florida and UF Health announced a $20 million gift from the Lauren and Lee Fixel Family Foundation that will be used to establish the Norman Fixel Institute for Neurological Diseases at UF Health. The gift will be matched dollar for dollar by UF.